This post first appeared in the Health Affairs Blog. On February 24, the Centers for Medicare and Medicaid Services (CMS) and the Office of the National Coordinator for Health Information Technology (ONC) issued the proposed “stage 2” rules for the meaningful use of electronic health records. Stage 2 unequivocally lays out three bold requirements that are sure to be transformative to the United States healthcare system over time. First, it standardizes data formats to dramatically simplify how information is both captured and shared across disparate IT systems. This will make healthcare IT systems truly interoperable, one outcome of which will be greatly expanding patients’ abilities to choose where to receive care. Second, it is emphatic that patients be able to access and easily download their healthcare records and images for their own use. This will spawn an industry utilizing this “big data” to provide solutions to patients and providers that help manage care, shop for care, and even invent new models of care delivery. Third, it expands the scope of tracked quality metrics to include specialists and to reflect outcomes as well as care coordination. Together, these three major requirements will drive the birth of new payment models and incentive structures leading to improved productivity and outcomes. As a result, Stage 2 will fuel an ecosystem of companies attacking healthcare inefficiencies in ways that are not yet even imagined. “Stage 2” commences in 2014 for providers who demonstrated stage 1 meaningful use in 2011. For all others, it begins in year four of meaningfully using an electronic health record. Providers who meaningfully use electronic health records will receive $44,000 in Medicare incentives over five years. For those who do not meaningfully use electronic health records, penalties begin in 2015 that grow up to a 5 percent reduction in Medicare reimbursement over five years. 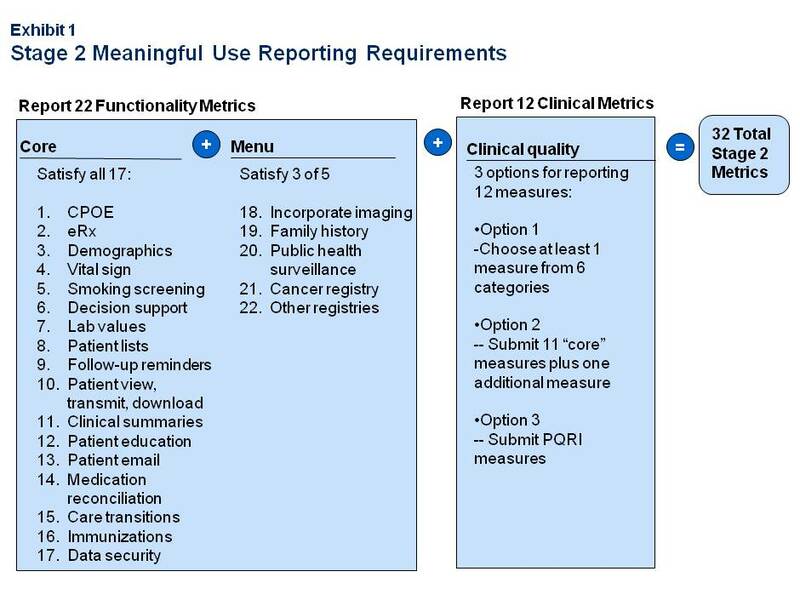 To qualify as a stage 2 “meaningful user” of electronic health records, providers need to comply with, and track, 20 functional metrics and 12 clinical quality measures. (See Exhibit 1 below, click to enlarge) The functional metrics are very similar to stage 1 albeit with higher performance thresholds in many cases. In keeping with the theme of stage 2, CMS emphasizes data sharing, patient engagement, and decision support in order to improve clinical quality measures. Rationalizing quality metrics. The clinical quality measures represent a major advance, aligning quality scorecards across HHS’ programs. A major burden for providers to date has been the checkerboard of clinical quality measures that HHS programs (PQRI, ACO, NCQA-PCMH, CHIPRA) ask providers to report. Stage 2 aligns all of these programs to satisfy the clinical quality measure reporting requirements. Hopefully, private payors will also adopt these measures for their quality programs since they will be already incorporated into certified electronic health records. If this occurs, it would radically reduce the complexity and burden of quality reporting for providers, and thereby increase clinicians’ focus on improvement. Furthermore, by expanding the pool of potential metrics, specialists will be able to select logical sets of measures to track and report with required decision support. Liberating data. While the mechanics are important, what makes stage 2 transformational is that big data sources and uses – likely across payors — will inevitably emerge. This will be a byproduct of the requirement that all data be captured using the same standards, the expansion of quality measures to cover a majority of healthcare spending, and the ability for patients to download data. The proposed rule requires providers to have at least 10 percent of their patients “view, download, or transmit to the third party their health information.” In a short time, an enormous trove of data will flow outside the electronic health records of physician offices. Big data offers great potential. In other sectors, mining large data sets has led to breakthroughs in productivity, consumer experience, and cost structure. It is also needed to make approaches such as IBM’s Watson super computer practical for healthcare, as the quality of machine learning results depends substantially on the amount of data available. It will not be long until patient level information is combined with large existing data sets like those being liberated by the Health Data Initiative. These combinations will generate far more accurate predictive modeling, personalization of care, assessment of quality and value for many more conditions, and help providers better manage population health and risk-based reimbursement approaches. Big data also enables payment reform. Stage 2 solves the circular problem of needing big data to support non-fee-for-service payment models, and needing new payment models to stimulate the production of the data. Stage 2 finally removes the barrier of lack of access to data through the ubiquitous reporting of so many quality measures and downloaded patient records. The transparency facilitated by far deeper, richer, and more timely and specific information will enable payors, consumers, and employers to pay differently for care. At a minimum and initially, huge variations in prices will be arbitraged, reaping savings for patients and payors. 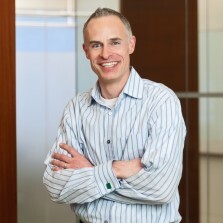 Over the longer term, it is likely that many variations of episode-based payments will emerge that are tied to specific improvement in outcomes; geographic markets will expand for patients shopping for care, thereby increasing competition; and new lower-cost delivery models will emerge for lower acuity and chronic conditions. The need for privacy and security. The big concern is rightfully privacy and security. Nothing would stifle progress faster then misuse of data. While the meaningful use program has specific security requirements for providers, it will be important for existing privacy rules and security requirements to be rigorously enforced. The virtuous cycle of innovation enabled by data liberation depends on trust by patients and providers. Patients will need confidence that the value they get from contributing their health data to datasets outweighs the risks. Providers will need similar confidence to encourage their patients to access their data and use the tools that will emerge. One hopes that a market quickly develops that has a high bar for privacy and security, engages patients in their health and healthcare, fairly represents provider performance, supports shared decision-making, and helps providers achieve clinical goals that increasingly are linked to reimbursement. While the public comment period will inevitably surface many skirmishes over details, the final rule should inculcate a path towards 1) new reimbursement models that reward outcomes and coordination; 2) massively more data to support patients and providers; and 3) a far more dynamic marketplace. Providers will be well served to view stage 2 not as a requirement to better use their electronic health records, but as a foreshadowing for how to compete and thrive in a future that is coming sooner then most anticipate or are prepared for: a future where a provider’s ability to deliver reliable outcomes, economic value, and exceptional patient experiences will soon be transparent to peers, competitors, payors, and, most of all, patients.